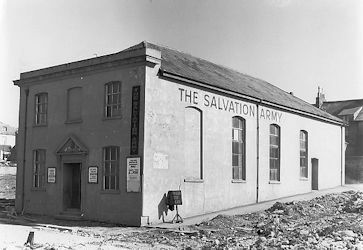 The Gloucester Street Salvation Army Hall, April 1958. The Salvation Army had in 1890 a Hall or Meeting Room in Gloucester Street which was formerly the site of the Wesley Association Chapel. It was on the south side of the Street, on the corner with Garden Street. It was one of a handful of buildings in Gloucester Street that survived the Second World but was demolished in the 1960s by Plymouth City Council.